The three smaller blackwork Christmas designs on this page can be mounted into aperture cards to send to your family and friends during the festive season. Alternatively, why not stitch two of each of them and make them into a set of six coasters to give as a Christmas gift? They would also make great christmas ornaments for the tree! 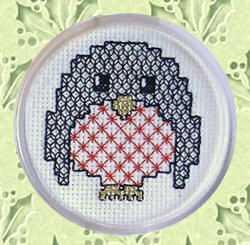 They make an ideal introduction to the blackwork technique All you will need is a small piece of fabric, a little floss in black (plus red for the robin) along with some sparkly metallic gold thread. Even if, like me, you tend to leave things until the last minute, you will find	that these designs each stitch up in around 2 to 3 hours. Download them now and have a finished project ready by the end of the day! The charts are presented in pdf format, so you can use them whether you are on a PC or a Mac. So all that is left for me to do is wish you a Happy Christmas and let you browse the designs and pick your favorites. Let's start with the largest of the designs, a sweet star. What would Christmas be without a star atop the tree. 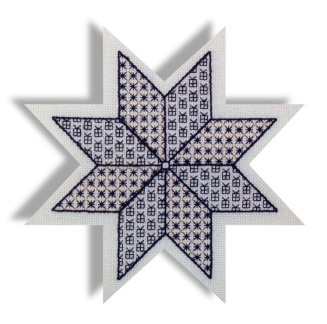 Using just two fill patterns featuring tiny stars and giftwrapped parcels this design is stitched in black and gold. 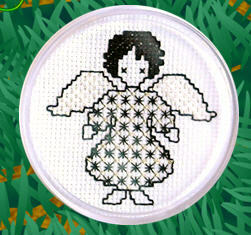 Stitched in black and gold this pretty angel would make a wonderful Christmas card or coaster. This cheeky chappy with his smart red breast is so cute everyone will love him. Pop him in a card to raise a bit of Christmas cheer. Can you hear the sound of bells ringing out on Christmas morning? 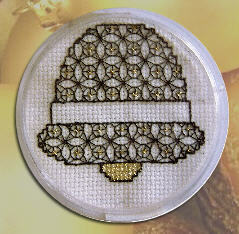 This design uses a slightly more complex blackwork fill pattern and a touch of gold metallic thread.